After Midnight Javatini — After Midnight Javatini is terrific for holiday late-night celebrations. 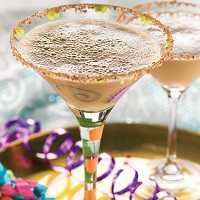 A chocolate-rimmed glass and a hint of coffee liqueur add a flavorful twist and a festive flair to this one-of-a-kind beverage. Buttery Mulled Cider — Wrap your hands around a fragrant, warming drink on a cold, blustery day! Smoky Bacon Bloody Mary — If you love Bloody Mary's and have never had one with the smoky taste of bacon, you are in for a treat. These two flavors make the absolute best Bloody Mary. Bacon vodka isn’t sold everywhere but if you can’t get it, you can order it online. Believe me when I tell you, it’s worth the trouble. The Smoky Bacon Bloody Mary is a star for sure.